We provide to our customers best Domestic Electrical Line Works. Our crew of professionals is well-experienced in its field and able to provide the complete satisfactions to the customers. We provide this work to our patrons at economical rate within prescribed time frame. 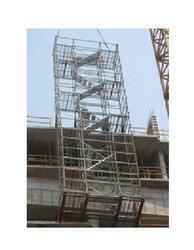 Levering on our years of experience, we hold expertise in offering Tower Maintenance Work. The offered service is rendered under the guidance of proficient professionals using progressive tools and technology in sync with industry norms. Our provided service is highly praised in the market for its features like prompt. Southern Communications Infrastructure Pvt. Ltd.
We have gained enough clout in the market and our highlights are installing double circuit and multi circuit transmission lines for our esteemed clients. Our EHV Transmission Tower are highly acclaimed in the market and the Tower Line work involves Survey, check survey, and span calculations essential for tower extensions. About Work: KMT Education Provide home based online work, Candidate have to fill form or OMR Sheet using software.